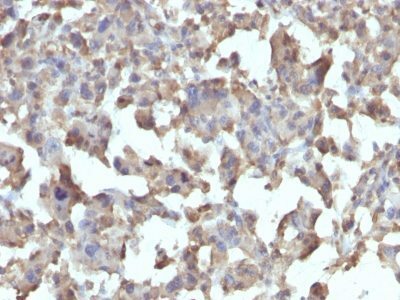 This MAb reacts with human Toll-like receptor 2 (TLR4). HeLa, PC12, human peripheral blood cells. Dendritic cells, macrophage and monocytes in tonsil; placenta and adrenal. This MAb reacts with human Toll-like receptor 2 (TLR4). It is a member of the Toll-like receptor (TLR) family, which plays a fundamental role in pathogen recognition and activation of innate immunity. TLRs are highly conserved from Drosophila to humans and share structural and functional similarities. They recognize pathogen-associated molecular patterns that are expressed on infectious agents, and mediate the production of cytokines necessary for the development of effective immunity. The various TLRs exhibit different patterns of expression. This receptor has been implicated in signal transduction events induced by lipopolysaccharide (LPS) found in most gram-negative bacteria. Mutations in this gene have been associated with differences in LPS responsiveness. Multiple transcript variants encoding different isoforms have been found for this gene. Catalog number key for antibody number 0230, Anti-CD284 (TLR4/230) The prefix indicates conjugation, followed by the antibody number and size suffix.